Thanks to everyone who came out to pose for Esther Vincent during our Postcards from the Drawing Room event! What a pleasure it was to dress you up and see you smoulder, shimmy and shine! Stay posted for more art events on First Fridays! 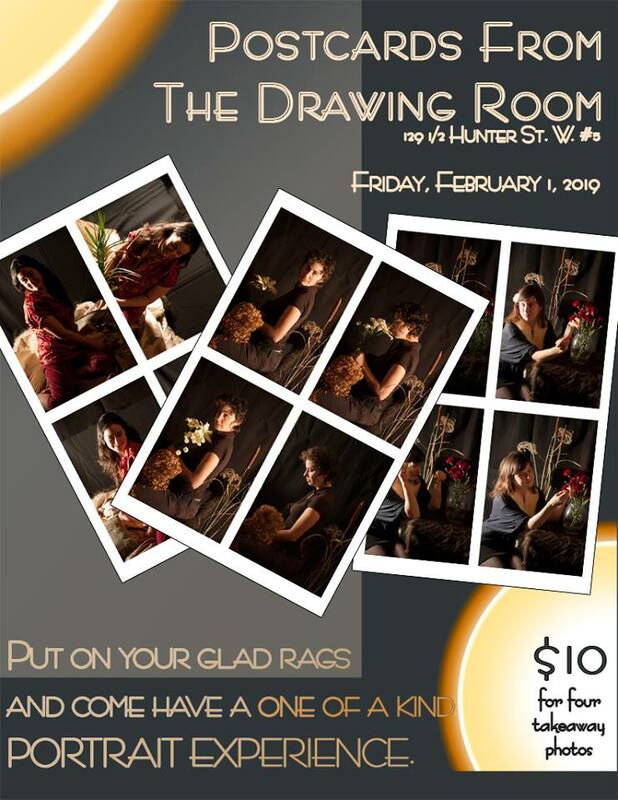 Friday February 1, 2019: Postcards From the Drawing Room is a temporary photo studio where you are invited to wear your favourite get up, get your photo taken and walk away with a set of small portraits. The Drawing Room will have select costume pieces and props on hand for those who wish to use them. Photo sessions will take approximately ten minutes. $10 for four wallet sized prints. Spaces are limited. Come early and bring your most alluring smile! Esther Vincent is fervent about colour, light, shadow and time. She also loves working with the camera. She delights in the click of the shutter, the precision of the settings and the subtle way that various lenses change the way things look. She moves through her days in wonder and awe at the constantly changing world around her and is thrilled when she is able to successfully crystalize tiny snippits of what she sees. Vincent learned photography from her father, working with him in his darkroom. Like her father did, she enjoys creating expressive photographs of the human subject. Finding the right mood to capture a person’s inner world is a challenge that Vincent embraces with ardor. Her professional focus is on portraits, events, journalism and archiving performance. Her published photographs have appeared in The Dance Current: Canada’s National Dance Magazine, The Globe and Mail, The Toronto Star, Pearl Magazine, The Peterborough Examiner and Canadian Organic Grower among others.